The Irwin S. Chanin School of Architecture of The Cooper Union hosts small tours for prospective students throughout the academic year. Tour guides are current Architecture students who have first-hand knowledge of the application process and life in The School of Architecture. They can speak informatively about the curriculum, faculty, facilities and The School of Architecture experience. 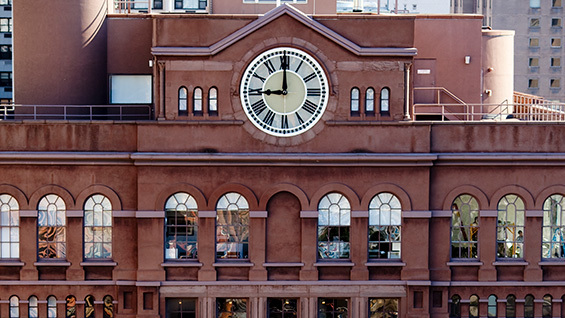 Tours will take place in The Foundation Building located at 7 East 7th Street, which is home to the School of Architecture, its studios, shops, labs, and other facilities. Registration is required. The School of Architecture holds an Open House for prospective applicants every fall. This year, the Architecture Open House will take place on Sunday, October 28, 2018. Registration is required. Register now! The School of Architecture will be sending a representative to select National Portfolio Day Association events. Please click here to see the 2018-2019 schedule. Please Note: Portfolios are only required for School of Architecture transfer applicants. First Year applicants should NOT submit a portfolio, but are welcome to have their portfolios reviewed at an NPDA event.